Making these for the first time in the fall, i was surprised at how crisp they stay. My cucumber pickles didn't stay as crisp and i used all the tricks up my sleeve. It has been fun this spring to use these little carrots that i don't have to chop, but if you don't have small carrots, cutting larger carrots into sticks is just fine and just as crisp. The recipe is so simple but you have to wait a couple of weeks for the full flavor to emerge. We don't add any spices or extra flavors but you can use dill, garlic, pickling onions or any of your favorite pickling spices and it works wonderfully. We just love the simple taste of carrots, but sour and fresh. Play and add your favorite flavors. 1- Submerge your jars, lids and seals in boiling water for a minute and let them cool in a clean sink. I use clean tongs to fish them out of the water. 2- Trim the tops and ends off of your carrots and rinse in cool water. 3- Stack the carrots or carrot sticks into the jars relatively tightly. 4- Measure the salt into bowl. Pour water into the salt and stir until it dissolves completely. 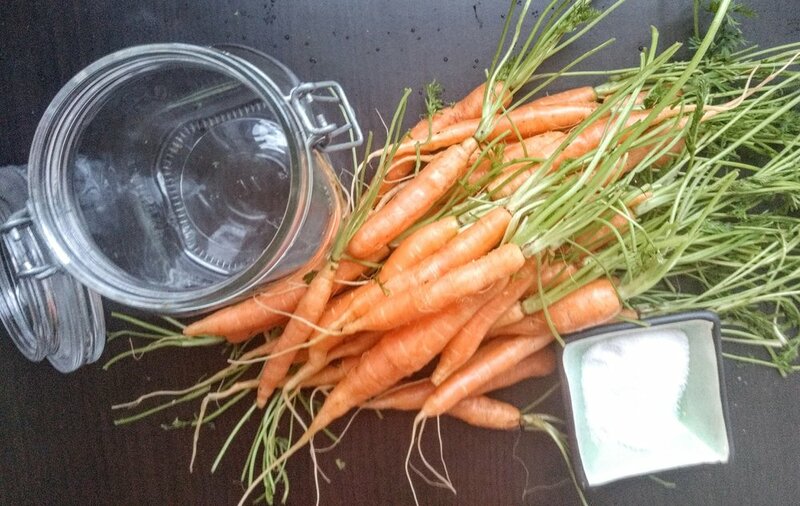 5- Fill the jars of carrots with salt water until the carrots are covered completely. Seal the lids, cover with a cloth and put into a safe place to ferment for a couple of weeks.